Macaroni & Cheese can satisfy anyone’s appetite. This version takes a Mexican twist with chorizo cheese, poblanos and other tasty ingredients. Think you know macaroni and cheese? Comes in a blue box from Kraft Foods right? Family standby for decades? Well, yes, but so much more. Macaroni and cheese is everything someone could want to eat – hot, melted cheese blended in creamy harmony with elbow pasta. It’s one of most families’ all-time favorite comfort foods. And such a versatile dish. Whether it’s Kraft classic or any of the many variations, it’s hard to get enough. But how did we get to this place, anyway? Surprisingly enough, it was through Thomas Jefferson, American founding father, principal author of the Declaration of Independence and third president of the United States. Yes, that Jefferson. Once a fashionable European food, historians believe macaroni and cheese originated in Italy and France, later making its way to the rest of the world. Jefferson introduced it to America in the late 1700s after feasting on the dish in France. He was so enamored that he brought home recipes as well as a pasta machine, served it at state dinners and a recipe even exists written in Jefferson’s own handwriting. What he enjoyed was most likely an Italian-style pasta such as penne or pappardelle with a cheese sauce made from Swiss Gruyere. Today, the classic macaroni and cheese that Americans know and love is made with a sharp cheese, usually cheddar, grated and melted over elbow pasta and milk for a just right cheesy, creamy texture. But of course, not all macaroni and cheese is made alike. 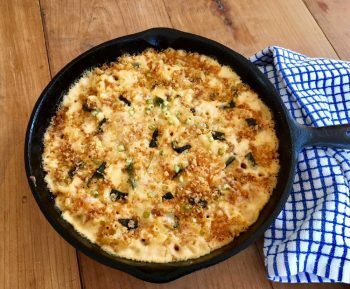 These days we have the culinary resources to make mac and cheese in endless creative combinations and this most American of comfort foods also can be Mexican, Indian, Italian, Greek, French or any cuisine in which cheese is a given. So a quest began in my kitchen to re-imagine macaroni and cheese with hints of another cuisine. Having decided to go for a Mexican twist, I started with the cheese, using a shredded 4-cheese Mexican blend instead of cheddar. Chorizo sausages browned without their casings, roasted poblano peppers, a dash of cumin and chopped green onions added more south of the border flavors. To add diversity to the cheese mix I substituted cream cheese for some of the other typically used cheeses. My husband, a life-long classic mac n’ cheese guy, gave the resulting dish his seal of approval. Hope your family enjoys it too. Cook pasta, drain and set aside. Set oven to broil and place poblano peppers on a baking sheet under the broiler. Broil, watching carefully for skin to blister. Remove and place in a brown bag. When cool, peel off the skin and chop roughly. Set aside. Melt 1tbs butter in skillet over medium heat. Add panko and cook, stirring, until golden brown ~4 minutes. Remove and set aside. Break chorizo into chunks and brown in the same skillet. Remove and blot with paper towel on a plate to remove grease. In a skillet, add 1 tbs olive oil. Saute onion till softened, adding chopped garlic about halfway through. Season with dry mustard, cumin, Adobo and salt/pepper. Stir in cornstarch till absorbed. Combine cheeses and heat in a double boiler or in microwave till melted, stirring occasionally. Add milk mixture and continue to stir or wisk till any clumps of cheese disappear. Mixture should thicken in ~ 5 minutes. Prepare 8×8 inch casserole or 10 inch skillet by coating with cooking spray. Combine macaroni, chorizo, poblanos, chopped green onions and cheese mix in a large bowl. Pour into baking dish. Top with toasted panko. Bake until golden brown and bubbling in the center, ~30-35 minutes. Let casserole cool ~20 minutes before serving.